A) I want to talk about this amazing dress, then B) we're gonna get to the blog link up down below! 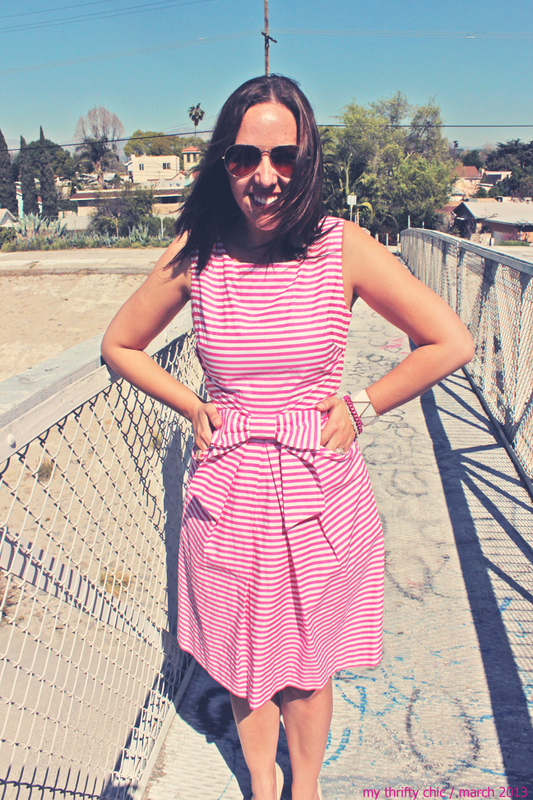 Starting with this pink striped frock... It happens to be Kate Spade, I happened to find it at the Goodwill (with tags) and I happened to pay $12.99 for it! What!?! How nuts is that? At first when I saw it, I almost didn't buy it because it is a size 2 (I am no size 2), but upon further inspection, I thought I could at least resell it. When I got home, some magical little elves must have let out some threads, because it actually fits me!! I did a happy dance all around my apartment! I am not normally a pink fan, but I'll make an exception with this adorable thing!! Now, onto our Blog Hop! 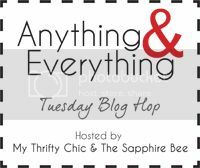 I have started a weekly blog hop (with The Sapphire Bee), and we will be hosting this link up every Tuesday from hear on out! This is a pretty simple link up, all the directions are listed below. Since I am kinda a jack of all trades (I use that term loosely), I would love for you to link up anything you've been working on! Perhaps you want to share your most recent vacation pics, or the book you're reading, or a really cool DIY... Anything goes here! Please link up, and remember to come back each week, and please tell your friends!! Thank you in advance, I look forward to the fun! Thanks for putting together this link up. I am excited to be a part of it. Looking forward to visiting new blogs. Such an adorable look! Thanks for hosting the linkup! Again. Absolutely floored by the stuff people give to your goodwill! WOW - I need to go to Goodwill ASAP now and maybe the shopping gods will be in my favor too. Just became your latest follower via GFC. You seriously get the best goodwill finds! That dress is amazing! Super cute ring too. Cannot believe you found that with tags too!! Wow! What a cute dress; and holy moly, awesome deal! I love great thrift store finds like that, although I never seem to be the one who finds them haha. This dress is beyond adorable!!!!!!! I am not a girly girly either but I would have bought it too! This dress is gorgeous! I am super jealous because even though I'm not a huge pink fan, the cut is too too cute!! Seriously, a Kate Spade dress for $12.99?!!?! what an AMAZING find! that dress is perfect on you! Shut up with this dress. I can not believe you got it for $12.99. It looks fantastic on you! 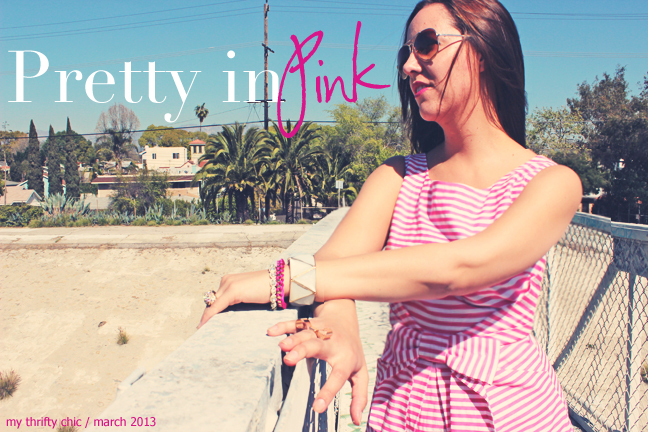 I LOVE pink, stripes and bows. Although I don't own anything from her. so fun!! i can't believe they even had a spade dress tagged that low. awesome that it fits, it does look great on you!! adorable! Thanks for the sweet words on my blog as well!! Linking up! Love your totally girly looks and I am lusting ove rthis bow ring! your dress is so nautical and i love it! Amazing find on your dress! So cute with the bow! Thanks for letting me link up! Very cute dress and classic heels! Love. New follower here ;) and joined the hop too! umm that dress is everything!! you're so lucky! You look so fab in that dress! I wish we had Goodwill's where I live! I cannot believe you thrifted that dress!! Wow, you really got that dress at a thrift shop?! I can't believe that bow ring was only $1.50! I'm in love! Just now seeing that's a KATE SPADE dress you got for $12.99! You are my shopping hero right now. oh my gosh, I can't believe the deal you got on that dress!! It's absolutely gorgeous! OMG - I love your dress!! Thank you for the link-up! The dress and that bow! OH MY!!! LOVE LOVE LOVE! This dress is amazing! I can't believe you only paid 12.99 on it! Adorable. p.s. Im your newest follower! I can't believe you found that dress at Goodwill - so fabulous! Thrifting is so hit or miss, so it is always a great feeling to find something like that. i just love that dress on you and the fact that it's thrifted makes me even happier ;) Just realized you had a link up, totally joining as the late girl haha! 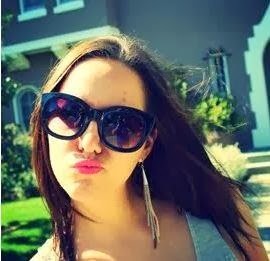 I love to shop at goodwill too sometimes, because, I love vintage so much, I oftens find high quality brand name with the best cost and good conditions still. You look fab on that pretty dress.